Thuja is a powerfully healing, strong tasting evergreen. The tincture 3 – 10 drops in a cup of water tastes a bit like turpentine, and is recommended for arthritis and muscle weakness especially acting on muscles controlling urination. Women following childbirth or surgery sometimes urinate with sneezing. Thuja tincture can be taken internally as a tea to strengthen those muscles. Thuja tincture is pungent and antiseptic for colds and flu and helps clear lungs to reduce coughing. The refreshing aroma of evergreen is energizing. 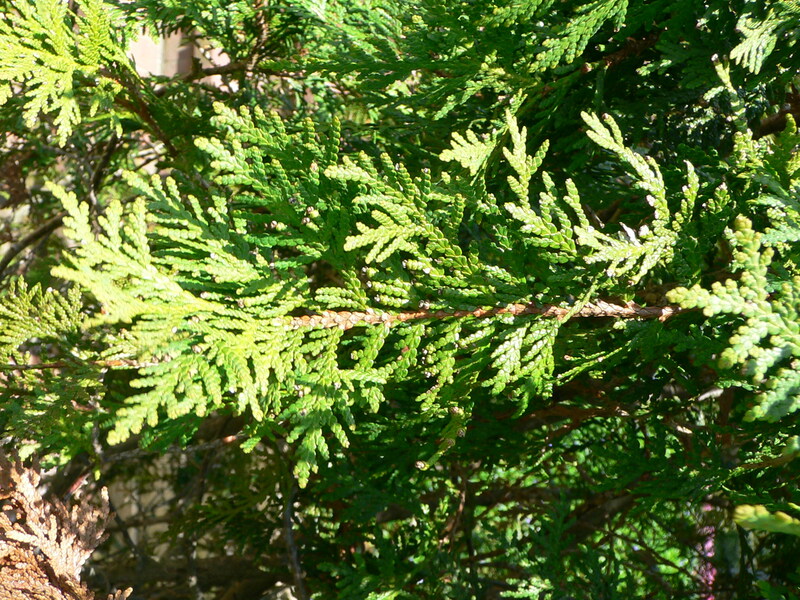 Applied externally for a period of time thuja tincture is recommended to remove warts. Be careful not to apply thuja tincture to cut skin or open wounds because it burns. I was interested in purchasing the Thuja tincture and noticed on internet that some extract was qualified as thuja leaf extract, other wildcrafted and branchlet extract and there is a huge difference in price. I would not know which one to use. Can you recommend some brand? Would like to strengthen the urinary bladder muscles and feel strongly about the curative effect of that plant. Thank you in advance and your site is greatly appreciated. i buy my homeopathic products from washington homeopathic in berkelry springs, west virginai. i believe i bought their thuja extract. i would try the lesser expensive brand since it is an evergreen, the ‘leaf’ is used for any thuja extract. I do not have a special brand of thuja tincture, purity is important so an established brand is recommended.